NEWS FLASH: Everyone is pulling great hits out of our Panini 2014 Father's Day Packs. Come in Saturday and get 1 FREE Panini Father's Day Pack with ANY Panini Product Box purchase ($40 or more) with a release date before March 15th. Sports Cards Plus, a.k.a. The Super Hit Factory has 1104 Panini 2014 Father's Day Packs. Pick your Father's Day Packs from THE BEST in The Hobby. Here is the list of Panini Program Products and the corresponding number of FREE 2014 Panini Father's Day Packs you will receive. DUE IN TODAY about 12:00 is 2013-14 Panini Innovation Basketball with TWO AUTOS and ONE MEMORABILIA per box for ONLY $89.99. DUE IN TODAY about 12:00 is 2014 Leaf Valiant Football with 4 Autos per box for ONLYT $85.99 per box. 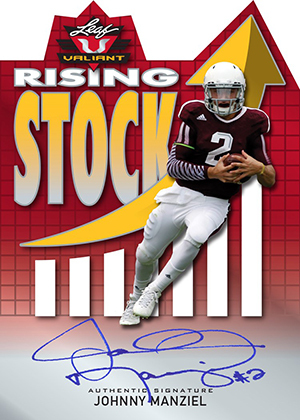 Here's your chance to get a great looking Johnny Manziel Auto. Pick your box from THE BEST CASES in The Hobby. ALSO DUE IN TODAY is 2014 Topps II Baseball. We have Hobby Boxes for $64.99 and HTA Jumbo Boxes for $115. Come on in and have some fun. WAIT. There's more. Due in TODAY is Historic Autographs Peerless with a PSA/DNA autographed cut per box for ONLY $69.95. Autographs include: Joe Louis, Jesse Owens, Walter Payton, Red Grange, Bronko Nagurski, Wilt Chamberlain, Dale Earnhardt Sr, Reggie White, Jack Dempsey, Arthur Ashe, Bobby Layne, Michael Jordan, Muhammad Ali, Pele, Wayne Gretzky, Andre the Giant, and more. So, what are you waiting for? Sports Cards Plus has the LARGEST selection of sports cards and memorabilia at LOW LOW LOW Prices. Pick your box from THE BEST CASES in the Hobby and enter our contests for $900.00 at Sports Cards Plus.